Jasmine fought the cat and lost. I had just started to feed the dogs and I guess Jazzy got nervous when Galadriel walked in. All of a sudden there was snarling and hissing and shrieking and barking! Naturally I checked the cat first after I separated them. There was blood in her fur but I found no actual wound. Jasmine, on the other hand, was licking her paw furiously. Her dewclaw nail was hanging by a thread, there was blood every where. 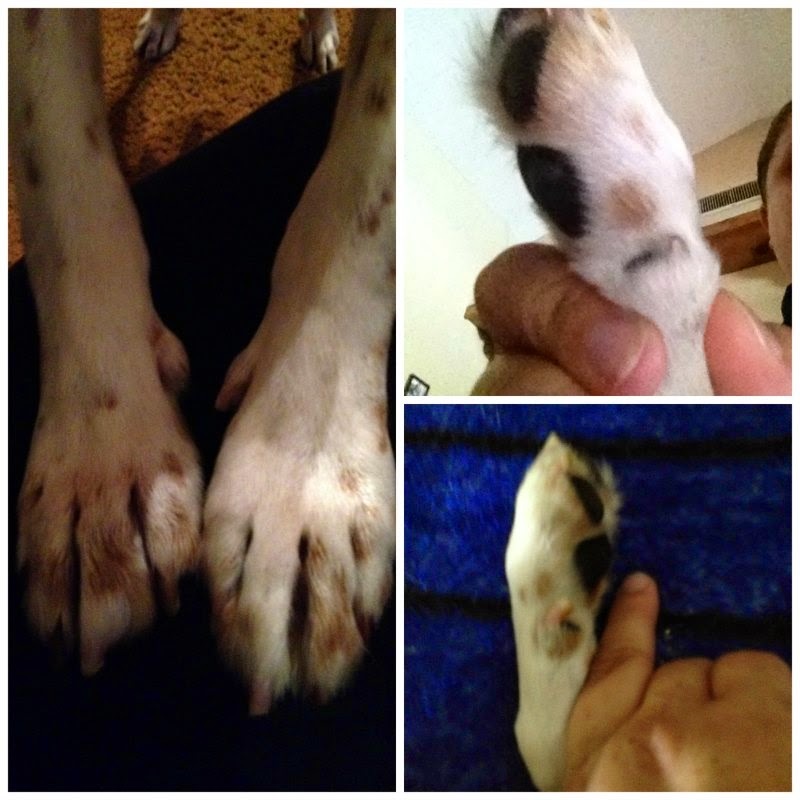 Jasmine's paws, her damaged dewclaw, and the dewclaw on her other paw. I managed to find a vet open early enough on a Saturday morning. But I was freaking out. I don't deal with my dog's nails. I take them to the groomer. So seeing the nail like that had me panicking. I asked groomer Brenda Cox from Blue Ribbon Pet Grooming in Oregon. 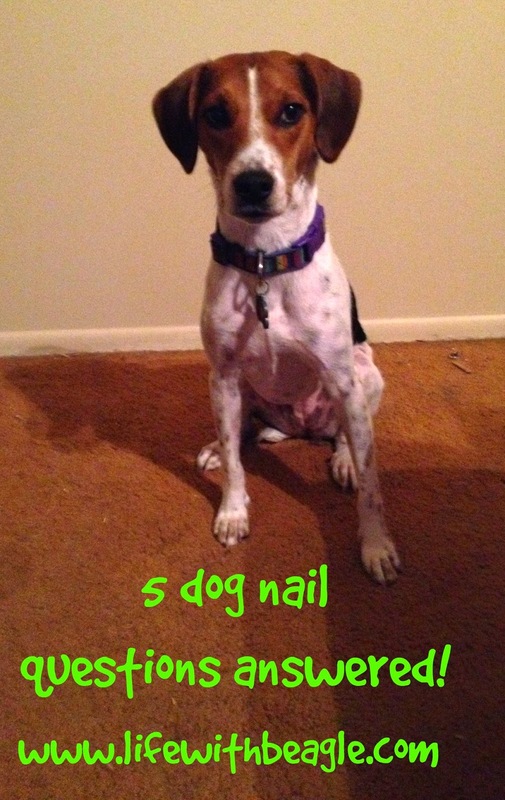 She helped me learn five new things about nail health. 1) You should have the nails cut every month, three weeks if you need them shorter. Brenda says the hard and fast rule is if you can hear the nails as the dog walks, they need to get cut. "Nails are very important to keep up on for the dog," Brenda said. "When the nail gets too long it's like wearing shoes too small and in time the nail will twist or toe will turn which can lead to early arthritis, but always will have a sore painful foot." 2) Watch for the quick (kwick). "Every nail has a quick or vein in them," Brenda said. "Depending on how the dog walks or level of activity will say where to trim, but always just to the quick." This diagram below gives you a good idea what the quick look like. 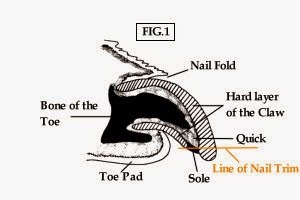 This also shows you that if you let the nail get too long, the quick will get longer too. 3. Dark or black nails are as difficult as they look. An experienced eye can better see where the vein is. For the rest of us, Brenda offered this advice. "If there are some clear or pink nails, one can sort of judge the same amount trimmed off," Brenda said. Which only makes me more determined to stick with my groomer. 4. Clipping or grinding is more preference than anything. 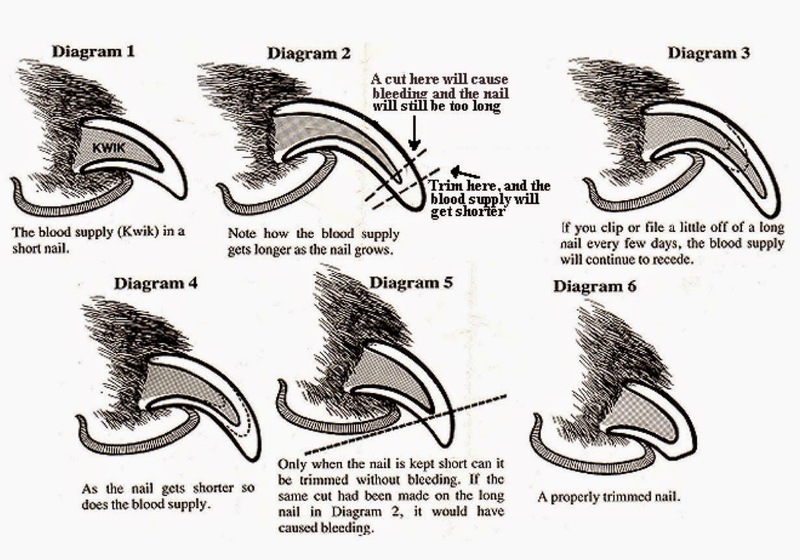 "Either is fine, but dremeling will get closer to the quick or vein in nail," Brenda said. "Also for thin skin people dremel is better." 5. Treat a broken nail immediately. And yes, lots of bleeding is expected. "If it is hanging on still, then trim if off immediately," Brenda said. "Vet would be ok but expensive. Your local groomer can also just have to hold the nail in a towel till it stops bleeding enough to put quick stop on." Also, just know that just because your dog doesn't like having his nails cut, doesn't mean you should cut the nails less. "Most people take that as "the dog doesn't like his feet messed with" and will do it less," Brenda said. 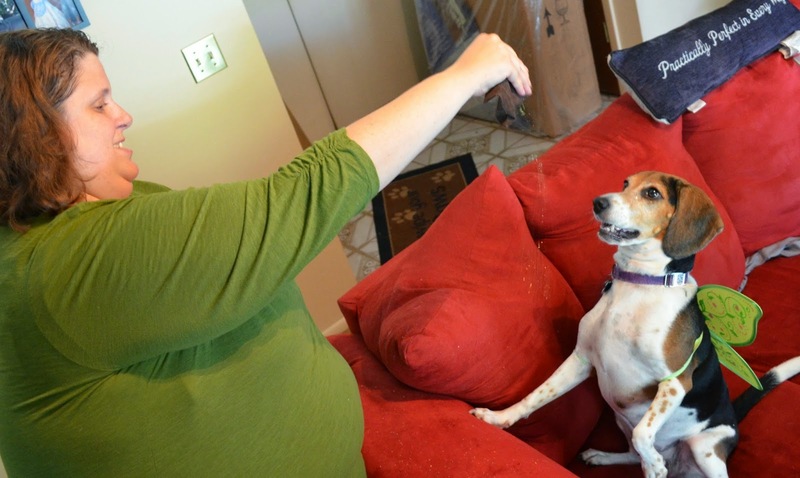 "The opposite needs to happen and keep it up more to keep dogs paws out of pain!" We are taking part in the Caring for Critters Round Robin. Head to the Heart Like a Dog community page to learn more about pet health. What does it mean to be economically secure as a pet owner? It means that when you want to go out and buy your pet food, you can do it without asking permission. If you want to pick up a new toy for your pet, no problem. 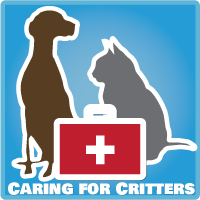 If you pet needs a vet appointment, you can schedule one and pay for it. And if you need to live on your own, you can afford the pet deposit in your rented home. For domestic abuse survivors, little of this is possible. The #PurplePurse campaign raises awareness of the kind of domestic abuse we rarely think about: economic abuse. When your abuser controls the purse strings, how are you to get out of your situation. And Harbor House of Central Florida is hosting a raffle to win a brand new purple Sherpa pet carrier, donated by Quaker Pet Group. Read on to find out more. Carol Wick, CEO of Harbor House of Central Florida, Orlando's domestic abuse shelter, said many people who come to them have little more than the clothes on their back. Eighty-five percent of women who come to a domestic abuse shelter reported pet abuse in their home. Harbor House is one of the few shelters in the country to have an on-site kennel for pets. Many of these pets come without necessary vet care. There is already a fund set up for that: Marvin's Fund. But Harbor House also has a fund for people who leave the shelter and want to find a pet-friendly place to live. This fund helps pay for pet deposits. That's why Harbor House is raffling off a purple (actually plum) Sherpa bag! It's the Sherpa Original Deluxe Pet Carrier, a soft-sided carrier, great for cats or dogs. It's also airline approved. The Sherpa is valued at $69.99. But from now until Oct. 1, you can enter our $10 raffle to win this bag! The #PurplePurse campaign is a national fundraiser by AllState. Shelters across the country are raising money and competing to win prizes. So please help Harbor House by donating $10 to help a domestic abuse survivor take their beloved pet to a new home. Enter today! PS: Don't need a Sherpa? You can still help! Harbor House is also hosting a $25 raffle for one of two purple handbags! One is a purple Coach bag. Then for an additional $10, you can enter to win a purple purse specially designed by actress Kerry Washington (Scandal) for this campaign. It's a $25 entry fee for the raffle. Please enter today! Purple Purse Raffle- The Sherpa Pet Carrier Raffle will take place online from Sept. 25th at 12:00 p.m. through Oct. 2 at 12:00 p.m. Each donation of $10.00 to our online CrowdRise fundraising page is worth one raffle ticket. All donations must be entered by Oct. 2 at 12:00 p.m. to be entered into the raffle. 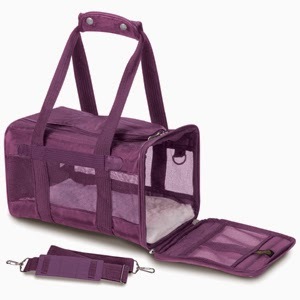 The winner will receive a Sherpa Original Deluxe Pet Carrier valued at $69.99. The winner will be contacted by phone following the conclusion of the raffle on Oct. 2 to arrange to receive their prize. 1.) Raffle Ticket Acquisition: Each donation of $10.00 is worth one raffle ticket. The donation must be completed online through CrowdRise. 2.) Eligibility: The raffle is open to anyone who donates online between September 25th at 12:00 p.m. and Oct. 2 at 12:00 p.m. Employees and Board Members of Harbor House are not eligible to enter. 3.) Timing: The raffle beings at 12:00 p.m. on September 25 at 12:00 p.m. and ends on October 2 at 12:00 p.m. 4.) How to Enter: No entry limit per person. To enter, complete the donation form on Harbor House of Central Florida’s Purple Purse Challenge CrowdRise page https://www.crowdrise.com/PurplePurse-HarborHouseCF/fundraiser/sherpabag. Correctly complete the official donation form and enter as directed. On the official donation form, all required information fields must be fully and accurately completed. 5.) Prize: The following prize will be awarded: One (1) Sherpa Original Deluxe Pet Carrier. The prize must be accepted as awarded. No cash or any other substitution may be made. 6.) Notification: Winner will be drawn at the conclusion of the online raffle on October 2 at 5 p.m. I am not being compensated for this campaign. I am spread the word about efforts to fight domestic abuse in my community. All opinions are my own. Teresa J. Rhyne has her life boiled down to the ABCs: A for alcohol, B for books, C for coffee and D for dogs. In her New York Times bestselling book "The Dog Lived (and So Will I)," Rhyne learns the letter L is for love with the help of a beagle named Seamus. When cancer rears its head, Rhyne learns how love can help her get through it -- not once, but twice, once for her dog and once for her. 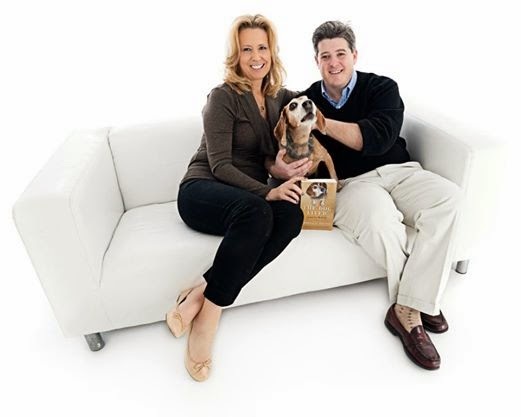 Now Rhyne, boyfriend Chris and Seamus the (famous) beagle are back in the upcoming follow-up, "The Dogs Were Rescued (And So Was I)." This time Rhyne is learning about something new -- compassion. 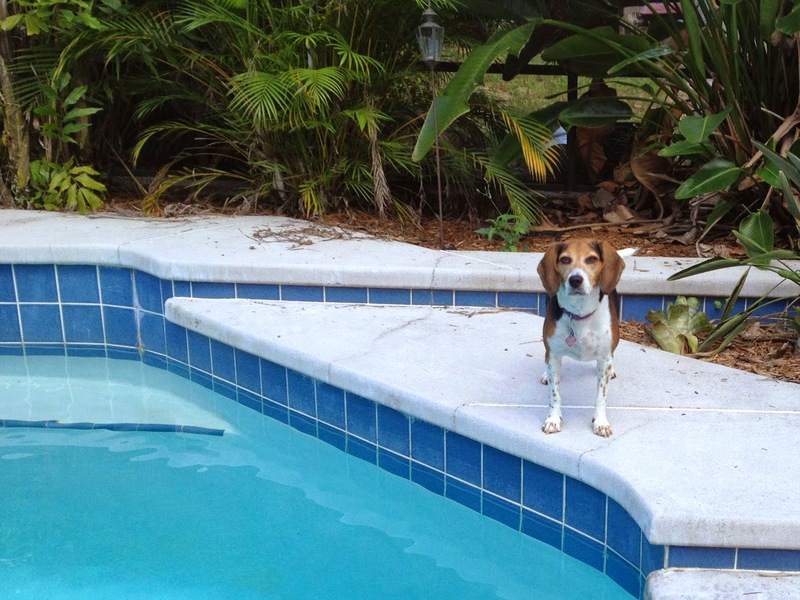 If you are a reader of Rhyne's popular blog and Facebook page, some of the content in the book will seem familiar: her trip to India, the tragic loss of Seamus, and the arrival of two spunky beagles with horrific pasts: Daphne, a beagle found on the street, and Percival, a freagle from the Beagle Freedom Project. But this book is about more than the next chapter in Rhyne's life. It's about her journey toward finding her place in the world, and being more compassionate towards all creatures. Rhyne's style is so very easy to read. She's lively and witty and a tiny bit sarcastic... *ahem*. Even at her gloomiest Rhyne tries to be at least somewhat uplifting for the readers. Another aspect of Rhyne's style that I appreciate relates to her move towards veganism. A decision she made in part because she was trying to get healthier, her ingestion of countless books and movies on corporate farming and treatment of livestock makes her a faithful acolyte of the movement. But even with her new dislike of steaks and cheese she rarely makes the reader feel like she is preaching to them, belittling them because they enjoy a good cheeseburger now and then. It's not about converting us. It's about hoping her journey teaches us something about ourselves and our own journey. "The Dogs Were Rescued (And So Was I)" comes out Oct. 7. But if you pre-order or buy a print copy of the book now through Oct. 31, a portion of the proceeds will go to Beagle Freedom Project. 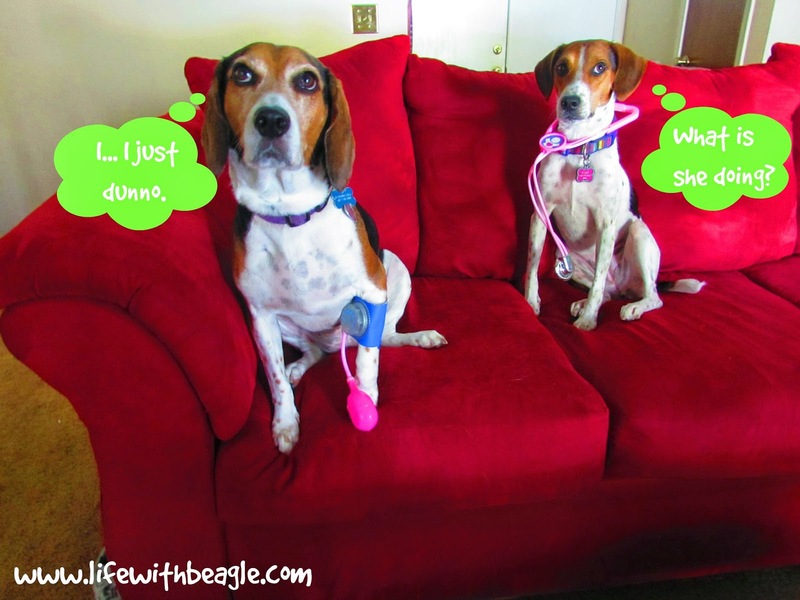 BFP works to free research lab beagles. And stay tuned -- we interviewed Teresa Rhyne. We will release that interview Oct. 7. You can order now on Amazon.com! 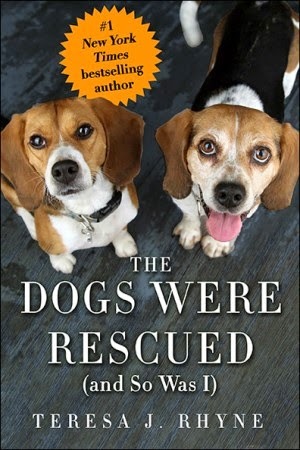 FINE PRINT: I received an advanced copy of "The Dogs Were Rescued (And So Was I). However, the opinions in this review are my own. When we say Whole Body Heallth, what does it mean to you? Exercise and diet? Clean fur? Brushing your pet's teeth? Natural Balance wants to know what you think. They dog and cat food company is hosting a survey right now, and it's a short one. They are asking pet parents what whole body health means to them. It's only five questions. The information will be used for a new infographic next month. Want to take the survey? 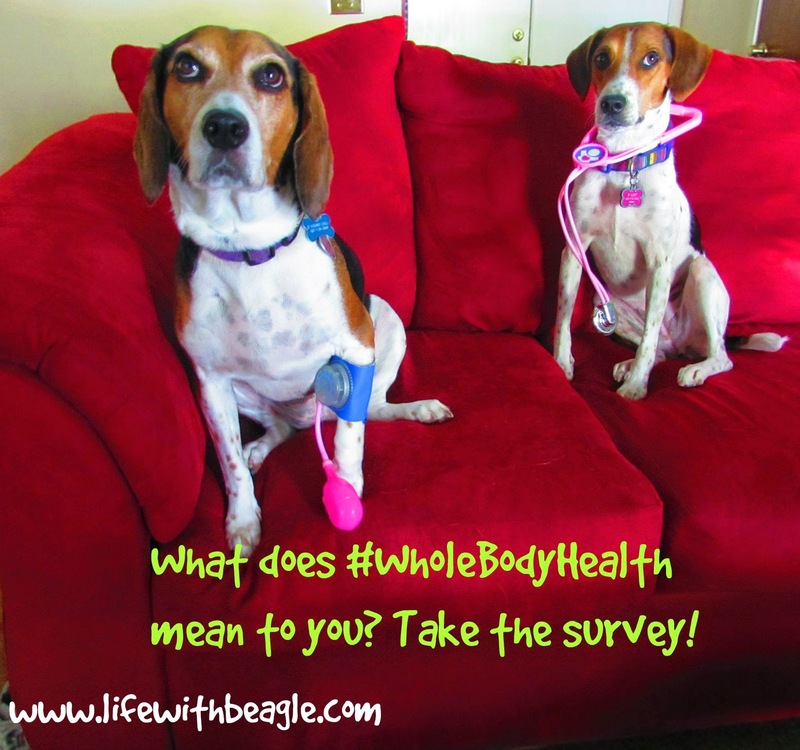 I have a link right here: #WholeBodyHealth Survey. The survey only runs through Sept. 28, so hurry. And thanks. I am being compensated for helping spread the word about the Natural Balance #WholeBodyHealth survey, but we only share information we feel is relevant to our readers. Natural Balance is not responsible for the content of this article. Jones Natural Chews is one of the sponsors of the Lulu's Favorite Things Campaign, which raises money for Harbor House of Central Florida's Paws for Peace Kennel. Please consider donating to their newest campaign, the Purple Purse Challenge. If you donate, they have a chance to win thousands of dollars from the Allstate Foundation, to help domestic abuse survivors re-establish their lives. It's starting to feel like fall for some of you. Some of you are even getting snow. Not here in Florida. Saturday has a high of 91 degrees. Not to say it doesn't have its benefits, but it's time for pretty leaves, apples, pumpkins, jackets, cinnamon, mulled cider and Halloween! Time to get the dogs interested too. And here's a chance to get you excited for Halloween too! 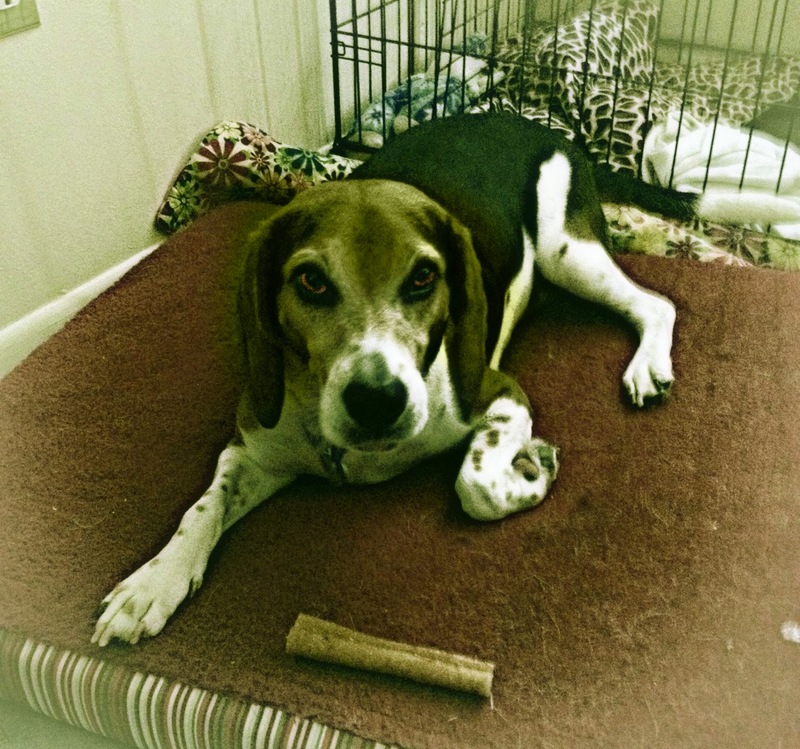 If you follow Life With Beagle, you've read our Jones Natural Chews reviews before. This is one of their newest and neatest treats. The bucket has nine items in it and is reuseable: a Windee, 2 Lambly Links, 2 Woofers, a beef Knee Cap, a beef hoof, an "other pig ear" (a piece of pig chin) and a bacon roll. 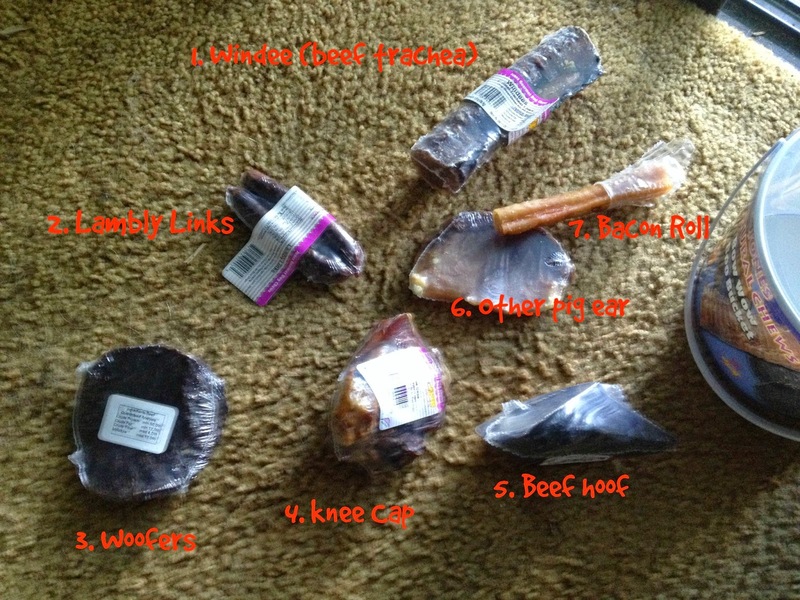 They are all great treats if you are looking for a special treat that keeps the dogs busy for a while. In case you didn't know, I love Jones Natural Chews. Their products are made in the USA, all natural (they rarely use anything other than the basic meat product) and are a family-owned company. Their products are not too expensive either. And, of course, the dogs love them. Jasmine tried her first beef trachea. It's tough for Lulu to work on, but Jasmine was able to get in there and break it open. Lulu chose the bacon roll from the bucket, which is a favorite of hers. Just don't try to take it from her. 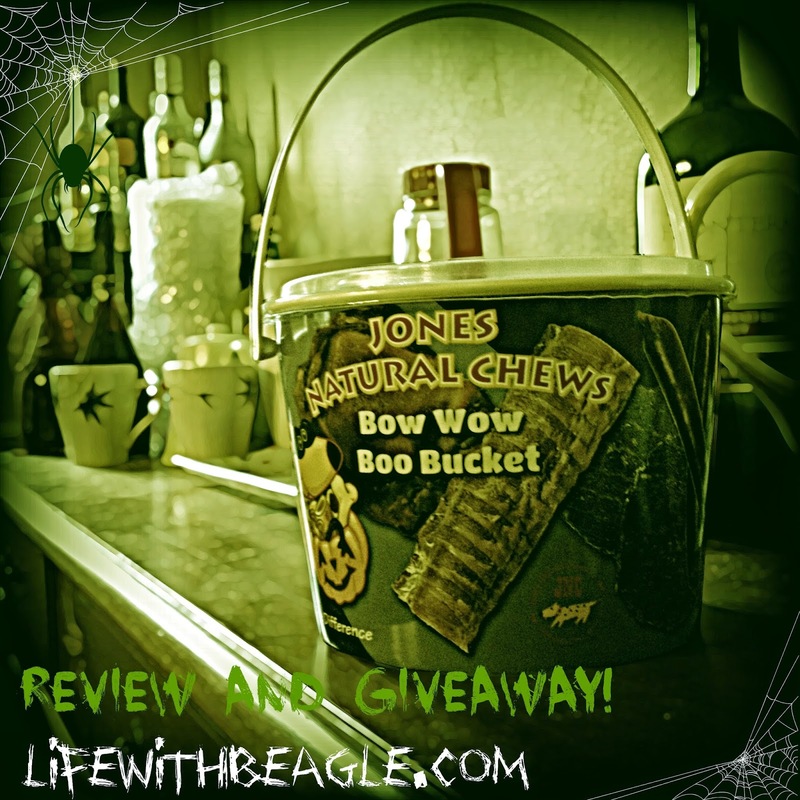 This giveaway is for one Jones Natural Chews Bow Wow Boo Bucket, mailed to your home in time for Halloween! Enter the Rafflecopter now through Oct. 1 for chances to win. There's only one mandatory entry -- you have to leave a comment on the blog below. I saw another one today. A fellow Facebooker and blogger posted a story about someone dousing a kitten with gasoline and setting it on fire. Then they put the video on Facebook. People complained to Facebook to get the video taken down. "People come to Facebook to share experiences of the world around them and on occasion this may result in the sharing of content that some may find upsetting. "While we do not allow content that directly encourages violence, we try to create a safe environment that balances people's desire to express themselves and in some cases condemn what they see." I get what Facebook is saying. I just don't agree with it. On the one hand, by allowing these people to post these videos we are able to find where the abusers are and alert the authorities. Many have been caught and arrested this way. It happened in this case from Brevard County, Florida in 2013 where a teen shooting animals in cages. He posted the video on Facebook for friends to see. But eventually he was caught and arrested. Or this case from France earlier this year, where a man was arrested for posting a video of a kitten being thrown against a building. If they can't post on Facebook, these people will just find another corner of the Internet to post this stuff, like 4Chan, where the rules are practically nonexistent. But for Facebook there is a higher moral problem. Facebook's people know full well how viral videos work. Context is not something that follows with the videos. There is also a danger of copycats seeing this stuff. The other problem is there is plenty of evidence that shows Facebook is not always taking down the pictures and videos that are of a sadistic nature. Well, here's a crazy idea -- don't share the videos when you see them! With anyone! Report the video, then share the person's Facebook page, not the video itself. What do I want Facebook to do? I think Facebook needs to listen to the people. When someone complains about these videos they need to be taken down. But then Facebook needs to do one more thing. They need to report these cases. They have the data on who these people are and where they are from. They need to be reported to the authorities. So how do you get Facebook to listen? Because there are like two dozen petitions out on the petition sites and nothing seems to change Facebook's mind. Facebook is a publicly traded company. It's time to hit the shareholders. Now, I don't have contact information, but I have found some places where we can start getting contact info. These are the people who have the power to change policy at Facebook. Talk to them. The website Who Owns Facebook.com has a list of all the stakeholders in the company, and where they work now. If I can find contact information I will post it here. More info is on the Yahoo! Finance page. Mark Zuckerberg has his own Facebook page, for those who don't know. So does his dog, Beast. Don't threaten. Don't get nasty. Just make it clear -- you want changes. Don't get emotional, don't ramble. You want changes because morally it is the right thing to do. These videos should be taken down when posted, whether they are contextually "sadistic" or not. 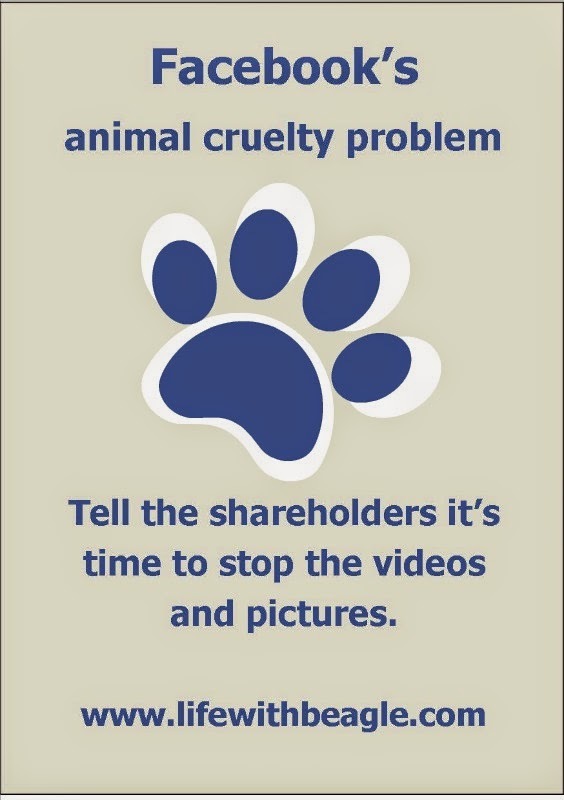 And Facebook needs to make a greater investment in making users understand they they will report animal abuse the way child abuse is reported. If your dog had a Disney Side, what would it be? 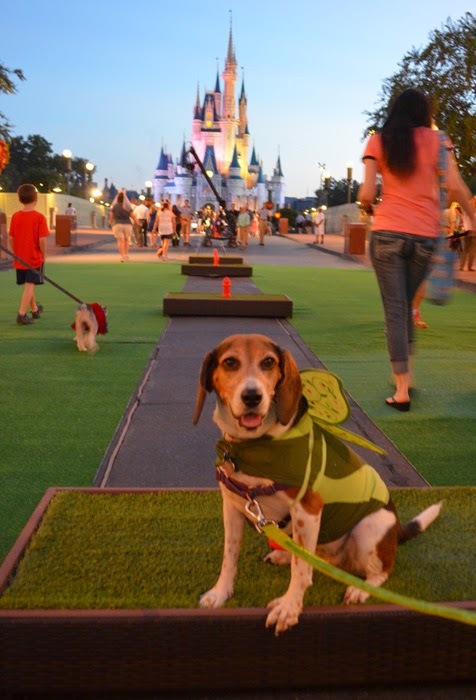 Walt Disney World in Orlando, Florida hosted a Disney Side Dog's Day at the Magic Kingdom. 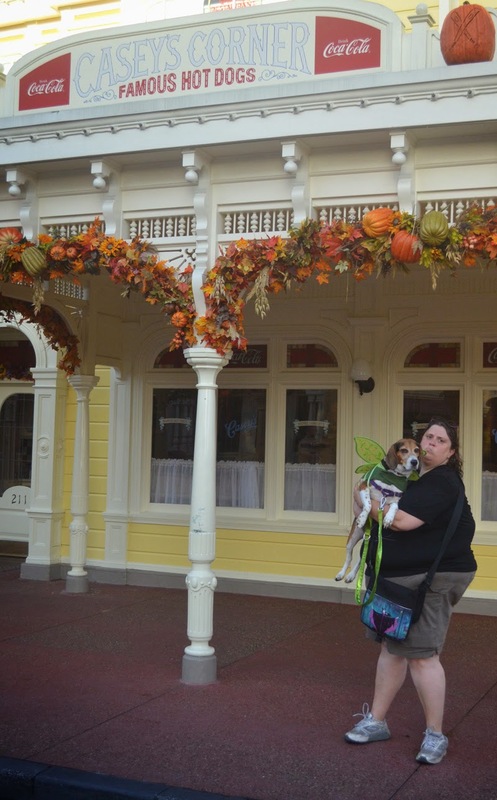 For the first-time ever, non-service dogs would be able to go to the Magic Kingdom. But you had to submit a photo of your dog, costumed, showing her Disney Side. As a Disney nerd, I knew I had to get Lulu in. But we didn't have much time to construct a costume for her, so the above picture is what I sent in: me as Peter Pan, Lulu as Tinkerbell. 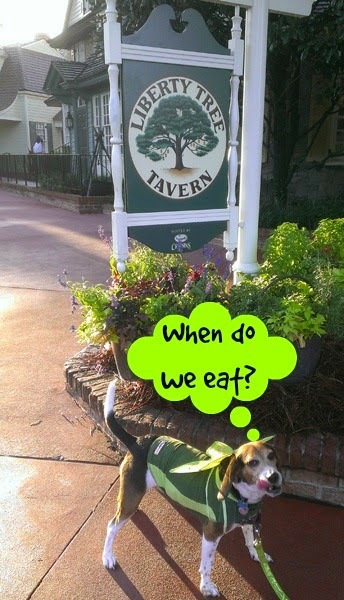 I got a green Thundershirt for Lulu to wear, since I knew she'd be needing one anyway, and we got up bright and early for a couple of hours at the Magic Kingdom. We walked the "green carpet" to Cinderella's Castle. We got to meet some characters. Goofy, Pluto, Bolt, Stitch, Dug and Cruella were out. 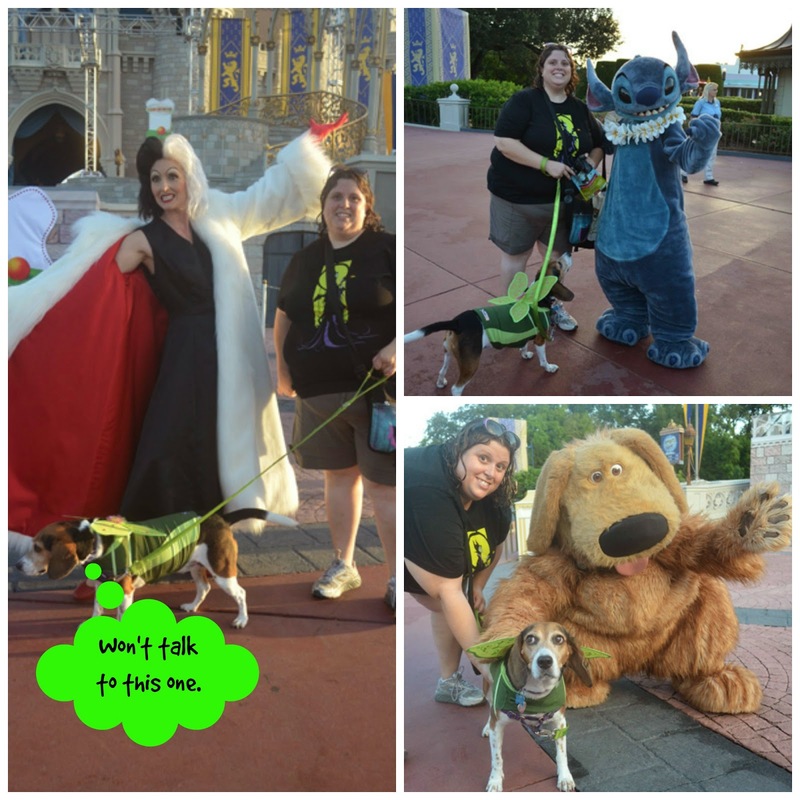 Lulu's met Pluto before and by this point the overstimulation was getting to her, so we skipped Pluto and Goofy. No Mickey though. Then we went on a doggy parade to see some of the park. The parade took us into Adventureland, Frontierland, Liberty Square and some of Fantasyland before letting us out through Cinderella's Castle and back on to Main Street. 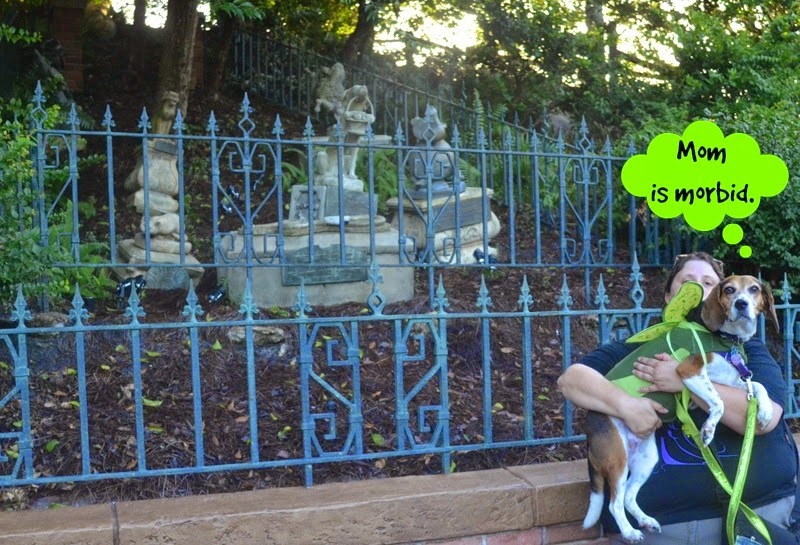 I got to take a photo with her in front of the Haunted Mansion Pet Cemetery! Casey's Corner wasn't open, so we couldn't share a hot dog. We all got treat bags to take home, and some other goodies too. 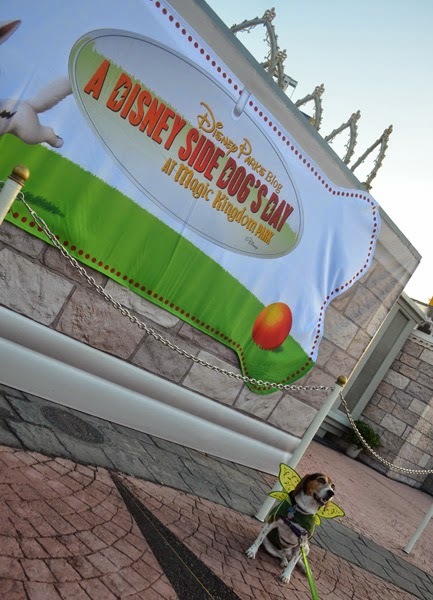 Want to see more from Disney Side Dog's Day at Magic Kingdom? Check out the video from the Disney Parks Blog, plus, coming in October there will be a special on Animal Planet!